Our work is to give support & solutions! 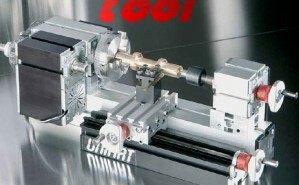 Active and practice-oriented handicraft lessons and technical training with Unimat machines. Examples, possibilities, fields of learning-from creative crafting in Elementary to CNC labs for technical vocational training. TheCoolTool GmbH is specialized in micro machines for the educational field from primary up to University level. Our series UNIMAT is a unique, multifunctional, modular tool system that allows students to work like on big industrial machines – but much safer and easier to comprehend. With UNIMAT students not only can evolve their creativity but also develop technical understanding – with practical orientation and fun. In addition the perfect cost-effectiveness, the high quality made in Austria and the long warranty periods make our products items not-want-to-be missed in technical training. In this paper we present lab equipment proposals that allow for active utilization of our machines even in bigger groups.